Folks gather in front of the old county poor house that served as a home for many who had no place else to go. The Overton County Historical Society can never be repaid for the work that group has done, and continues to do, toward the preservation of the history of Livingston and Overton County. One Saturday morning recently, I visited what was once known as the Poor House Cemetery recently saved by the Historical Society from total destruction. With the help of Livingston Mayor Frank Martin who provided many city employees and equipment, the first round of hard labor involved in the restoration process has been completed. The cemetery is located on Villa Drive, a street that used to be called County House Road. Much work is yet to be done to get the cemetery put back together again, but through the diligent efforts of this concerned and dedicated organization, I’m confident it will be accomplished. Ronald Dishman has complied a tremendous amount of information about the history of the County Poor House, some of which I will share as my journal entry this week. In checking the definition of the word “sexton”, I learned that person was “an officer of the church who is in charge of sacred objects.” It would be interesting to know just exactly what Mr. Grannis was in charge of in those two churches. Mr. Grannis’s death certificate shows the cause of death as being “toxemia”. Joe Rayborn, single; date of death - 12/12/1954; age 74. Leonard Johnson, single; date of death - 11/9/1936; age - about 65. 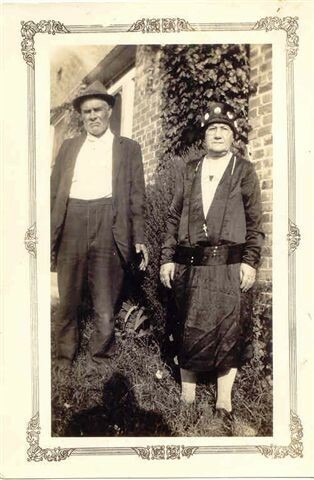 James Robert Qualls, superintendent of the County Poor House, and wife Rebecca Stewart Qualls who served as manager for around 25 years during the 1920's. Many of the sunken, unmarked graves in the County Poor House Cemetery are quite obvious, and among them, there are several children’s graves. 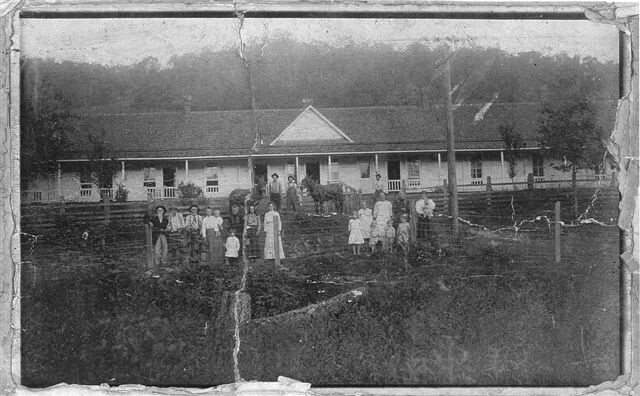 During the years 1926 through 1946, James Robert Qualls served as superintendent of the Poor House, and his wife, Rebecca Qualls was manager. Rebecca Qualls’ notes contained in a Webster Composition ledger type book lists all the names of the residents who came and went during that 20 year time period. Often a name listed is a single parent, and will also include the words “and children” with that parent’s name. I couldn’t think of anytime sadder than to know that some mother or father had no place else to go to provide food and shelter for themselves and their children. James Robert Qualls’ obituary that was printed in May of 1942 described Mr. Qualls as 71 years of age, and was a widely known citizen of Livingston. He had been sick for several months prior to his death. His funeral was held on May 11, 1942, at Ruth’s Chapel church by Rev. William Dycus of the Cumberland Presbyterian church. The obituary went on to say that Mr. Qualls had been superintendent of the county asylum or “poor house” for most of the time during the past 25 years. He was widely known for his honesty and integrity, and it was generally said that he was well fitted for the work that he had been doing. He was survived by his wife, Mrs. Rebecca Stewart Qualls, three daughters, Mrs. R. M. Wolfe, Mrs. Winnie Savage, and Miss Willie Qualls; one son, J.P. Qualls; one sister, Mrs. Martha Watkins, and one brother, Golden Qualls, all of near Livingston. The county home built to replace the one that burned was still in existence when I was small. I can remember going there as a child with my mother. She went there to visit Bennett and Mary Ann Smith who were our neighbors, and were also the care givers at the county home in the early ‘50s. I didn’t like going there at all. I thought of it as being a very scary place The building stood near the present day location of the Villa Place Apartments. There was always an atmosphere of sadness that seemed to hang over that old building like a dark cloud. I suppose that same dark cloud was inherited from the earlier home where many sought shelter after having no other place to go. That same feeling of sadness can be felt standing in the Poor House Cemetery today. Within each of those graves was a person who met with hardships and heartaches along life’s journey, and in most situations, had no one to love them or care about what happened to them. The fact that any reference to any of the residents at the County Poor House was with the word “inmate” shows how little those individuals were thought of. Even the building was known in some instances as an “asylum.” But thanks to the Historical Society, at least now, some long overdue recognition is about to happen. Included in the plans for restoration of the cemetery will be a monument that lists the names of those persons buried in the County Poor House Cemetery. Persons who have information about additional names not included here are asked to contact any member of the Historical Society so an accurate list can be prepared. Prior to the monument be placed there, much hard work and physical labor must be done. Shirley Key has already begun the placing of stones on some of those unmarked graves. I’m sure she would welcome help with that project. Should anyone want to visit the cemetery, metal steps were provided by the city to make access to the cemetery possible. A nice sign with the name of the cemetery has been erected near the street. Donations for the restoration and recognition of this very worthy project would be welcomed, and may be given to any Overton County Historical Society member.